Jackson County is Mississippi's 'most industrialized county' with 12 facilities reporting to the EPA's Toxic Release Inventory. Mississippi Phosphate, a company that produces chemicals used in fertilizers, accounts for 23% of the total TRI releases in Jackson County. Out of the entire United States, this company ranks 84th on the list of most polluting chemical companies, a list that is 2,927 industries long. Their reported releases include: 810,049 pounds of ammonia into the air, 48,298 pounds of sulfuric acid to the air, 8,325 pounds of lead to land and more. In their most recent TRI report (2012), the company releases total over 1,090,932 pounds of pollutants into the local environment. Since 2009, the MDEQ has only issued 12 'cease-and-desist' orders, four of which have been to this plant. Looking for suggestions in air quality monitoring techniques for local residents. Ammonia and other acids are a major concern. 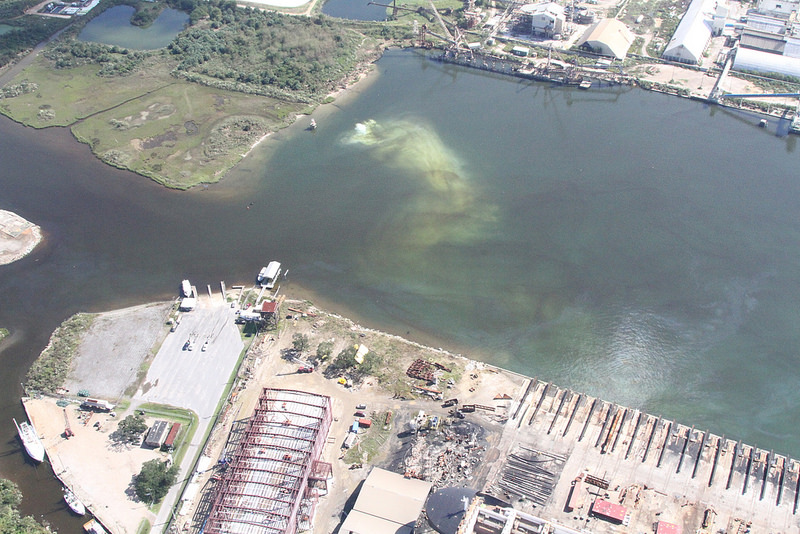 Local residents of Pascagoula Mississippi are worried about the pollutants in their community. Today's Sun Herald reported that 'a neighborhood of 150 homes across industrial Bayou Casotte from Mississippi Phosphates was complaining about acid smells and health problems while being plagued by dust, noise and vapors.' And for me personally, there is Alice, a dear friend and 96 year old grandmother who lives in this neighborhood. She deserves better air to breathe. That's a lot of ammonia, sulfuric acid and lead - yikes. Where did you find those numbers? Do you have a link? 12 Cease and Desist orders make a mockery of the words "cease and desist." Yeah I got those numbers off the TRI page if you go to the main TRI page (http://www2.epa.gov/toxics-release-inventory-tri-program), search the zip code: 39567 and click on mississippi phosphates it will give you the numbers for that company specifically. The 12 cease and desist orders weren't all for this company, it was -- in total the DEQ had given out 12 CADs to companies since 2009, four of which have gone to MS Phosphates. Any suggestions? Work on a nuisance claim. Document any health symptoms that could be related to the bad air. white sheet test--put a white sheet outside for a week, photograph it for dust. Save interior Air filters for air conditioning, label and date them. these may come in handy later, if hte PM profile is ever identified, the air filters could show the same profile in Alice's home. These are all things that can help an environmental case later. the immediate problem is the nuisance of the plant. the plant is impacting Alice's quality of life, and the plant must remedy that if you can take it to a judge and she agrees. On Monday last week (06/23) the Concerned Citizens of Cherokee in Pascagoula held a meeting where Howard Page (of the Steps Coalition) Wes Smith (production manager at Mississippi Phosphates) and Barbara Weckesser (of Cherokee Concerned Citizens) each spoke. The purpose was to discuss the problem and to define steps that Mississippi Phosphates will take to clean up their act. Prior to the meeting Mississippi Phosphates offered the neighborhood group an air quality monitor (according to the Mississippi DEQ) but I've not been able to find any more details. I'm curious to know what was offered or what the plan for monitoring is. If the company itself is directing the effort, I'm not over confident in the interpretation of results, which should be made public. Interesting. Did you go to the meeting? Did you happen to hear what air monitor it is? Mat, you're not kidding. danke. Stevie, do you know Howard? Would Howard know how to get this information? Just got off the phone with Howard Page (of STEPS Coalition). Mississippi Phosphates has not followed up on their promise to provide the neighborhood group with air quality monitoring. I think there is a meeting next thursday with the community? I can't go, but I would really like to hear what happens. Sadly, Barbara is still at it. 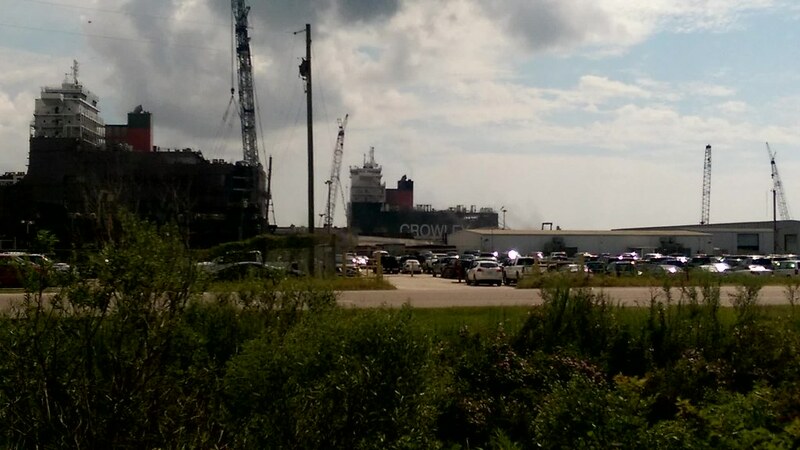 The photo shows the plume, but also a diesel spill from Martin Energy that was happening at the same time, so my apologies, but the white color of the plume is somewhat obscured by the brownish color of the diesel spill. It's kind of exhausting to look at this. Halter Marine is also a facility, a ship / paint stripping yard in the south of that oct 11th photo. 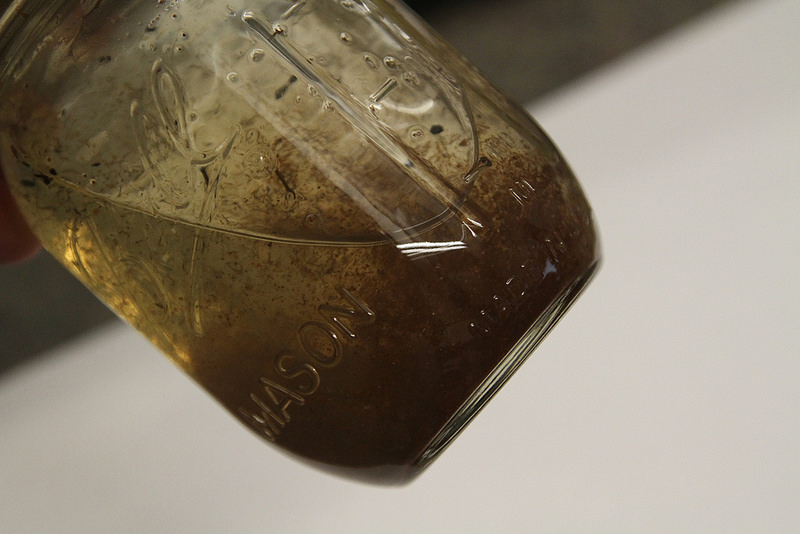 Here's a sample of Water from Bayou Chicot, I think, from 2016. I have to ask Howard. yuck... Thanks for the updates on the site. Sad this is still a problem!